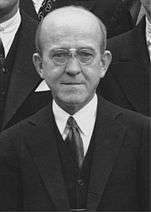 Oswald Theodore Avery Jr. FRS (October 21, 1877 – February 20, 1955) was a Canadian-born American physician and medical researcher. The major part of his career was spent at the Rockefeller University Hospital in New York City. Avery was one of the first molecular biologists and a pioneer in immunochemistry, but he is best known for the experiment (published in 1944 with his co-workers Colin MacLeod and Maclyn McCarty) that isolated DNA as the material of which genes and chromosomes are made. The Nobel laureate Arne Tiselius said that Avery was the most deserving scientist to not receive the Nobel Prize for his work, though he was nominated for the award throughout the 1930s, 1940s, and 1950s. The lunar crater Avery was named in his honor. For many years, genetic information was thought to be contained in cell protein. Continuing the research done by Frederick Griffith in 1927, Avery worked with MacLeod and McCarty on the mystery of inheritance. He had received emeritus status from the Rockefeller Institute in 1943, but continued working for five years, though by that time he was in his late sixties. Techniques were available to remove various organic compounds from bacteria, and if the remaining organic compounds were still able to cause R strain bacteria to transform then the substances removed could not be the carrier of genes. S-strain bacteria first had the large cellular structures removed. Then they were treated with protease enzymes, which removed the proteins from the cells before the remainder was placed with R strain bacteria. The R strain bacteria transformed, meaning that proteins did not carry the genes causing the disease. Then the remnants of the R strain bacteria were treated with a deoxyribonuclease enzyme which removed the DNA. After this treatment, the R strain bacteria no longer transformed. This indicated that DNA was the carrier of genes in cells. Alfred Hershey and Martha Chase furthered Avery's research in 1952 with the Hershey–Chase experiment. These experiments paved the way for Watson and Crick's discovery of the helical structure of DNA, and thus the birth of modern genetics and molecular biology. Of this event, Avery wrote in a letter to his youngest brother Roy, a bacteriologist at the Vanderbilt School of Medicine: "It's lots of fun to blow bubbles but it's wiser to prick them yourself before someone else tries to." Nobel laureate Joshua Lederberg stated that Avery and his laboratory provided "the historical platform of modern DNA research" and "betokened the molecular revolution in genetics and biomedical science generally". The collected papers of Avery are stored in two locations: the Tennessee State Library and Archives, and the Rockefeller Archive. Many of his papers, poems, and hand written lab-notes are available at the National Library of Medicine in the Oswald T. Avery Collection, the first of their Profiles in Science series. ↑ Barciszewski, J. (1995). "Pioneers in molecular biology: Emil Fischer, Erwin Schrodinger and Oswald T. Avery". Postepy biochemii. 41 (1): 4–6. PMID 7777433. 1 2 Dubos, R. J. (1956). "Oswald Theodore Avery 1877–1955". Biographical Memoirs of Fellows of the Royal Society. 2: 35–26. doi:10.1098/rsbm.1956.0003. JSTOR 769474. ↑ Hotchkiss, R. D. (1965). "Oswald T. Avery: 1877–1955". Genetics. 51: 1–10. PMID 14258070. ↑ "Oswald Theodore Avery, 1877–1955". Journal of General Microbiology. 17 (3): 539–549. 1957. doi:10.1099/00221287-17-3-539. PMID 13491790. ↑ Dochez, A. R. (1955). "Oswald Theodore Avery, 1877–1955". Transactions of the Association of American Physicians. 68: 7–8. PMID 13299298. ↑ Judson, Horace (2003-10-20). "No Nobel Prize for Whining". The New York Times. Retrieved 2007-08-03. ↑ Reichard, P. (2002). "Osvald T. Avery and the Nobel Prize in Medicine". Journal of Biological Chemistry. 277 (16): 13355–13362. doi:10.1074/jbc.R200002200. PMID 11872756. ↑ Avery, Oswald T.; MacLeod, Colin M.; McCarty, Maclyn (February 1, 1944). "Studies on the Chemical Nature of the Substance Inducing Transformation of Pneumococcal Types - Induction of Transformation by a Desoxyribonucleic Acid Fraction Isolated from Pneumococcus Type III" (PDF). Journal of Experimental Medicine. 79 (2): 137–158. doi:10.1084/jem.79.2.137. PMC 2135445 . PMID 19871359. Retrieved 10 March 2016. ↑ Davies, Kevin (2001). Cracking the Genome: Inside the Race to Unlock Human DNA. The Free Press. ↑ "The Oswald T. Avery Collection". National Library of Medicine. Retrieved April 28, 2011. Diamond, Arthur M. (1982). "Avery's 'Neurotic Reluctance'". Perspectives in Biology and Medicine. 26 (1): 132–136. Lehrer, Steven (2006). Explorers of the Body (2nd ed.). United States: iUniverse, Inc. ISBN 0-595-40731-5. Sri Kantha S: Avery's non-recognition in Nobel awards. BioEssays, 1989; 10:131. Avery, O T; Macleod C M; McCarty M (October 2000). "Studies on the chemical nature of the substance inducing transformation of pneumococcal types: Induction of transformation by a desoxyribonucleic acid fraction isolated from Pneumococcus type III. Oswald Theodore Avery (1877–1955)". Clin. Orthop. Relat. Res. 379 (379 Suppl): S3–8. doi:10.1097/00003086-200010001-00002. PMID 11039746. Austrian, R (July 1999). "Oswald T. Avery: the Wizard of York Avenue". Am. J. Med. 107 (1A): 7S–11S. doi:10.1016/S0002-9343(99)00109-6. PMID 10451004. Lederberg, J (February 1994). "The transformation of genetics by DNA: an anniversary celebration of Avery, MacLeod and McCarty (1944)". Genetics. 136 (2): 423–6. PMC 1205797 . PMID 8150273. Amsterdamska, O (1993). "From pneumonia to DNA: the research career of Oswald T. Avery". Historical Studies in the Physical and Biological Sciences : HSPS / Office of History of Science and Technology, University of California, Berkeley. 24 (pt 1): 1–40. PMID 11623400. Russell, N (December 1988). "Oswald Avery and the origin of molecular biology". The British Journal for the History of Science. 21 (71 Pt 4): 193–400. doi:10.1017/S0007087400025310. PMID 11621687. Pirie, N W (December 1972). "Avery in retrospect". Nature. 240 (5383): 572. doi:10.1038/240572a0. PMID 4568407. Coburn, A F (1969). "Oswald Theodore Avery and DNA". Perspect. Biol. Med. 12 (4): 623–30. PMID 4900165. Stegenga, Jacob (2011). "The chemical characterization of the gene: vicissitudes of evidential assessment". History and Philosophy of the Life Sciences. 33 (1): 105–127. PMID 21789957. Kay, Alan (1970). "Avery, Oswald T.". Dictionary of Scientific Biography. 1. New York: Charles Scribner's Sons. pp. 342–343. ISBN 0-684-10114-9.